I’m not generally a purist when it comes to colors: I actually prefer my Ferraris in subtle hues like greys and earthy metallics. I’m not a huge fan of British Racing Green. And silver is a great color for daily-driver Mercedes, it’s a bit bland if you’re spending over $100,000 on a car or bike. But when it comes to Laverda, there’s only one color for me: orange. 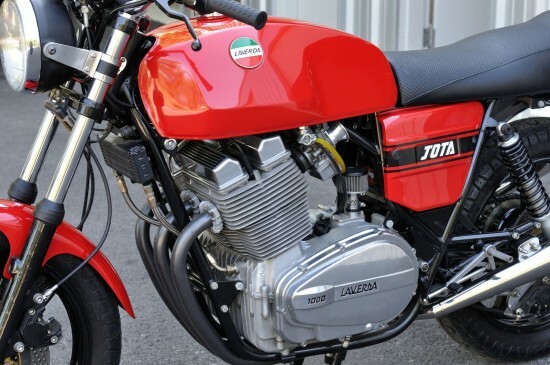 That’s not to say bikes like this Laverda Jota don’t look amazing in red, or silver, or green. It’s just that, if you have a good excuse to own a bike slathered in screaming tangerine paint, it seems like you should fully take advantage. 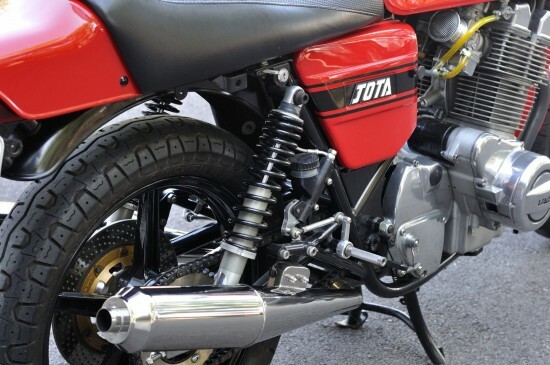 The original Jota is a bit of a hot-rod, built up by Slater Laverda, a dealer and tuning shop based out of the UK. Laverda’s 981cc triple in the 3CL was clearly understressed, and Slater saw the performance potential just waiting to be unleashed. They took the basic, rugged package and upgraded it with high-compression pistons, higher-lift camshafts, and a free-flowing exhaust. The modifications resulted in 90hp and a top speed of 146mph. For a time, it was the fastest bike in the land. And even after it was superseded by faster machines, it was still the manliest bike in the land: early machines used a 180° camshaft that had the outside pistons rising and falling at the same time, which made for wild power and a raw feel that has been likened to an inline four with a miss… Controls were heavy, seat height tall, and they were generally unruly, but characterful beasts. 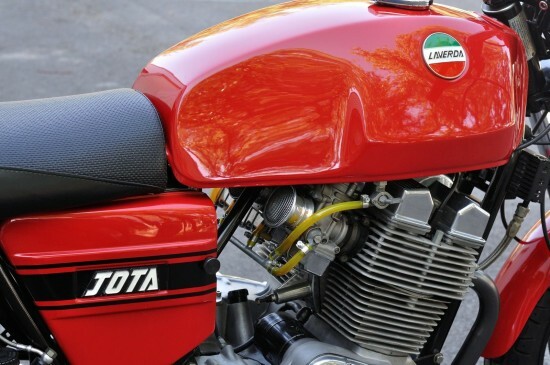 This Laverda Jota was built in July 1977. This particular bike was originally sold in Southern California. I bought it a couple years ago and thought I would ride it here it Texas however things have changed and I am now offering it for sale. 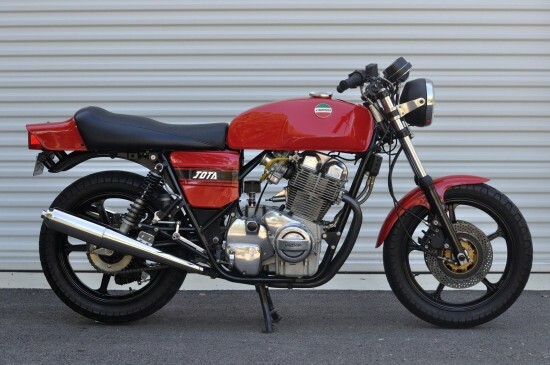 I have owned three previous Laverda’s: a 1976 3cl with Jota cams etc., and a 1978 3cl, and a coveted 1974 SFC (the last new one on the planet in 1978). 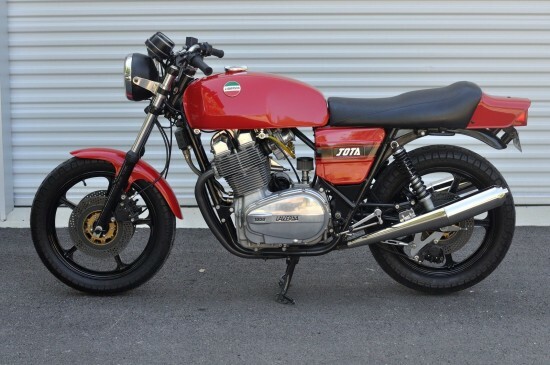 However this Jota is special and has super low miles. This bike was set up to race at Riverside in the 80’s but never got the chance (AMA changed the requirements) so I am told by the previous owner. The bike was completely disassembled and modified slightly. If you look closely on the pictures you will notice the frame was reinforced in the air filter area. If you look close at the exhaust down tubes you will see another reinforced cross tube installed. 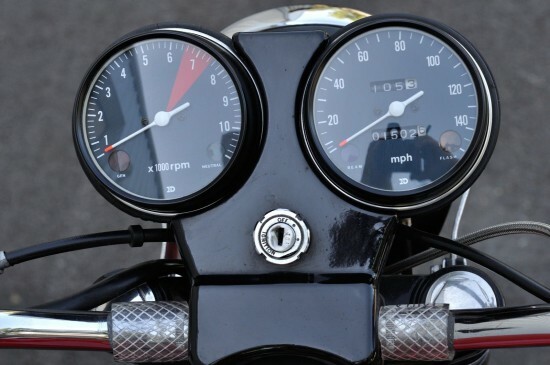 These frame modifications stabilize the bike at higher speeds. There are custom made foot levers for the gear shifting and the brake assemblies. You can see that the rear disc brake was also modified in an upside down configuration. One off parts to accommodate the mounting. All the modifications are done with forethought and implementation. The powder coating on the frame, wheels, and fork sliders is very thick and shiny. This bike sounds incredible, idles perfectly, and runs like a Jota should. Handles beautifully. It is robust and throaty. The paint is excellent. One imperfection on the back tail piece is a hairline crack near the mounting screw. Probably overtightened at one point. Tires are in good shape. I located new Vox bell horns and they will be included along with a mirror, purchased from Wolfgang. I forgot to take a picture of under the seat area and battery. It is as nice as the rest of the bike. Any questions shoot me an email. So while I’d prefer my Laverdas to be orange, this looks to be a really great, although not completely original example. But really, the Jota wasn’t a factory model anyway, and varied from region to region in terms of specification, so what are a few more performance updates between friends? The work looks to be a very high standard and, color aside, this is one of the nicest Laverdas I’ve seen in a while. I had a 3C that was set up to Jota spec which I sold in a moment of weakness. I’d love another one but at the prices they command now I guess I’d go with a Speed Triple or MV or even a Yamaha.